Both Evelyn and James love soft play and it can be a great way to let them burn off some of that built up energy especially on wet rainy days. However soft plays do seem to all be quite similar and its easy to feel like if you've been to one you've been to them all! But that's where Little Giggles soft play centre are breaking the mould with their fun, sensory soft play experience! 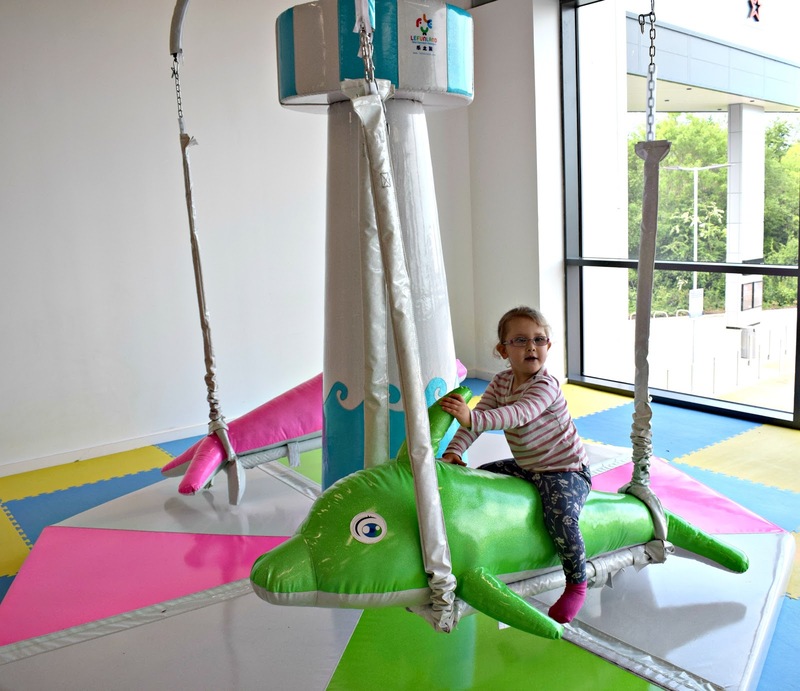 Little Giggles soft play is based in Yate (just across the road from the main shopping centre and bus station) and is aiming to break the perceptions of your typical soft play centres with their new centre which has a strong focus on development through light and movement play. 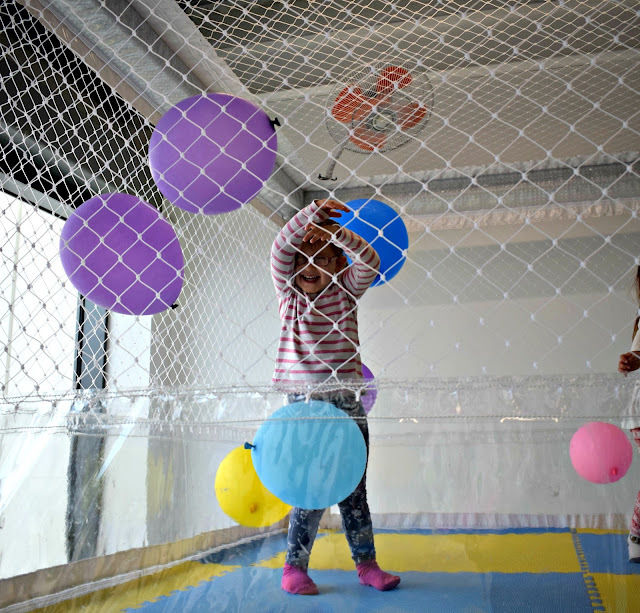 Nearly all the equipment within Little Giggles has a moving or light up element to it giving a great sensory feel as well as providing lots of stimulation, fun and excitement for the kids. Little Giggles is on the upper level of a new development in Yate (stairs and lift to entrance) and we have been so excited to go try it out (me as well as Evelyn of course!). There is tons of parking so we didn't need to worry about that and upon entering we were greeted by several friendly staff members all clearly visible by their fun vibrant uniforms. Payment was quick and easy and off we went to enjoy the centre. Within the soft play centre there is the main soft play area as well as a large seating area with tables and chairs and a café serving hot food such as jacket potatoes and panini's as well as cakes, soft drinks and coffee/tea. Evelyn's eyes lit up at the sight of the soft play and it really is something totally different to your typical soft play centres. Gone is the dingy multi level, outdated soft play apparatus its all about the funky, clean and vibrant equipment here and the lights certainly do catch your eye. Evelyn loved the fact that lots of the items moved without having to ask me to push her (she likes to be independent!). It really feels like each piece of equipment has been carefully thought out here at Little Giggles with everything having a light, sound or touch element rather than just being something to climb. 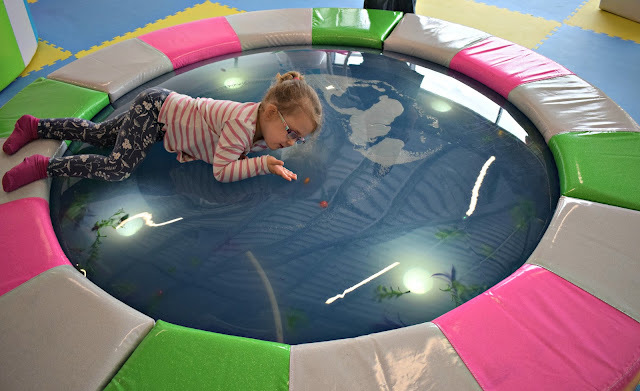 Something we had never seen at a soft play before was this water table! Its such a fantastic idea and can be jumped on, led on or just to jiggle about on, there are plastic fish and seaweed as well as lights concealed within and its such a great idea. Evelyn loved trying to catch all the fish! Even the slides had an extra element with the one below having cascading lights and the larger slide (seen in the background here) has a "bubble wrap" feel with giant plastic air pockets all the way down the slide! I was a big fan of the layout too as all the tables face the main soft play area and the whole area is visible from the seating area so those with slightly older children who prefer to head in alone can still keep watch on your little ones. We didn't eat any hot food in the café today as we went straight from the morning school run but the food did smell delicious as we were leaving just before lunch. We can also vouch that the cookies and millionaires shortbread slice was scrumptious and I would say the prices were quite fair at around £4.50 for 2 cold drinks and 2 cakes. Little Giggles is for children age 0-8 with children under 9 unable to play however I would definitely say the soft play would be more suit to ages 1-5 as James is 7 and I'm not sure he would be as entertained as Evelyn was. 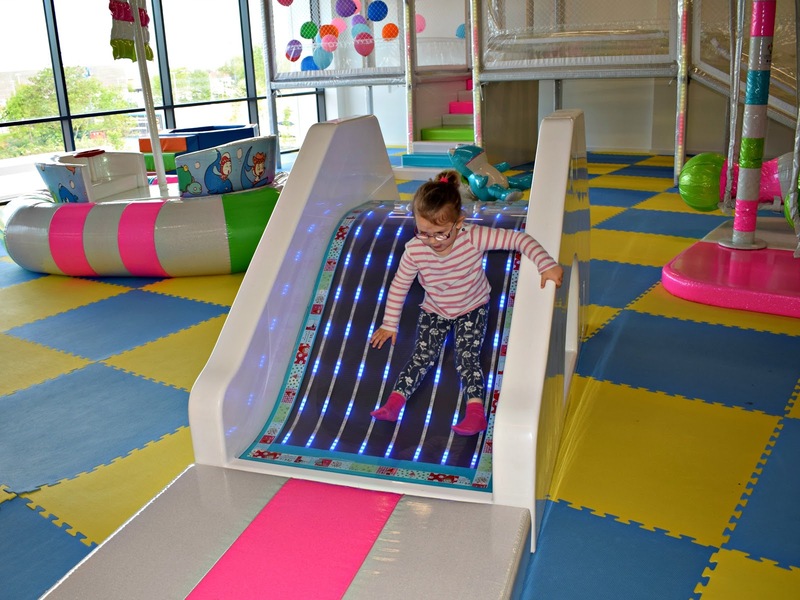 Prices for entry in to the soft play may seem a little more expensive than your "average" soft play but this definitely is NOT your average soft play and so the prices do reflect how much thought and effort has gone to making this soft play as great as it is. There is also no time limit to play (unless the centre gets very busy when they may inforce a 2 hour play limit) so we felt whilst it was a little more expensive it was most definitely worth it. If you are planning on visiting regularly there is also the option of becoming a member too which brings down the prices of each visit for the entire year! 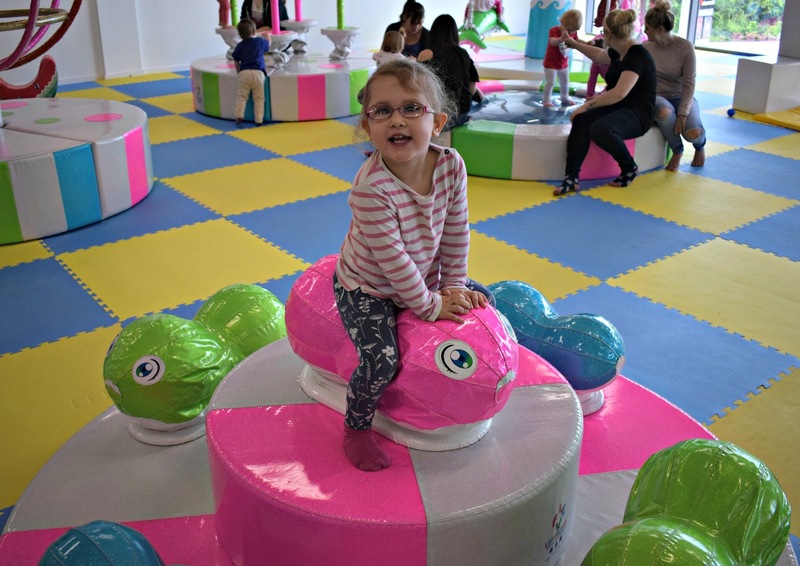 If you are thinking of visiting Little Giggles soft play do it! You won't regret it and I am certain both you and the kids will want to return, soft play just won't be the same for us again as Little Giggles have certainly set the bar high and we will certainly be back... very soon! Do you think Little Giggles is somewhere your kids would love too? It is a shame that this seems too young for my 8 year old as he has sensory processing disorder and it looks like it would have been perfect when he was younger. WOAH! First thoughts are it looks amazing, unique and bright! My little ones would love something like this! It looks so fantastic, fresh and well thought out! This place looks amazing - they don't have anything like this where I live - my kids would have loved it when they were younger! Crikey! That's some clever use of colour there. Never seen a soft play area so bright!!! 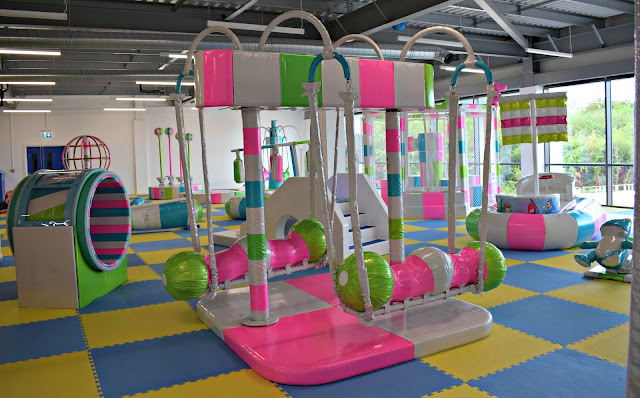 wow that soft play area looks amazing, wish I was a little kid again! We have never seen a soft play centre like this! Love that it has a sensory feel to it with all the light up areas! The slide looks cool! My kids love soft play centres. They would adore this.